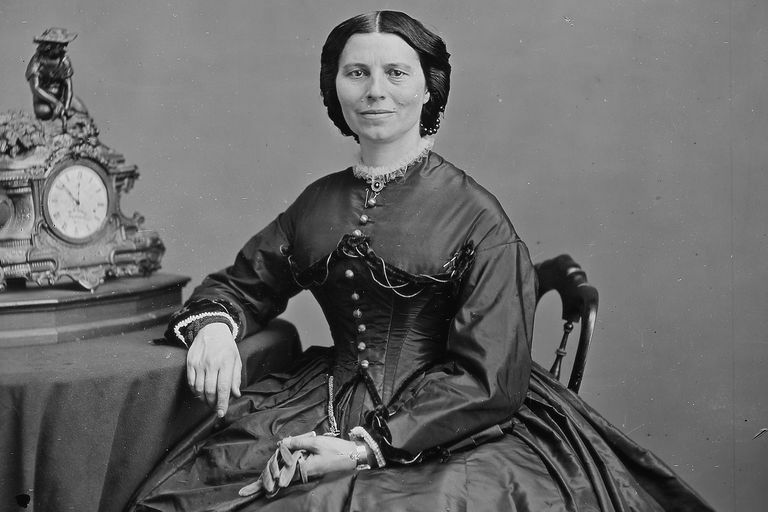 Clara Barton, who had been a schoolteacher and the first woman to be a clerk at the US Patent Office, served in the Civil War nursing soldiers and distributing supplies for the sick and wounded. She spent four years tracking down missing soldiers at the end of the war. Clara Barton established the first permanent American Red Cross society and headed the organization until 1904. • An institution or reform movement that is not selfish, must originate in the recognition of some evil that is adding to the sum of human suffering, or diminishing the sum of happiness. • I may be compelled to face danger, but never fear it, and while our soldiers can stand and fight, I can stand and feed and nurse them. • The conflict is one thing I've been waiting for. I'm well and strong and young—young enough to go to the front. If I cannot be a soldier, I'll help soldiers. • What could I do but go with them [soldiers of the Civil War], or work for them and my country? The patriot blood of my father was warm in my veins. • A ball had passed between my body and the right arm which supported him, cutting through the sleeve and passing through his chest from shoulder to shoulder. There was no more to be done for him and I left him to his rest. I have never mended that hole in my sleeve. I wonder if a soldier ever does mend a bullet hole in his coat? • Oh northern mothers wives and sisters, all unconscious of the hour, would to Heaven that I could bear for you the concentrated woe which is so soon to follow, would that Christ would teach my soul a prayer that would plead to the Father for grace sufficient for you, God pity and strengthen you every one. • I don't know how long it has been since my ear has been free from the roll of a drum. It is the music I sleep by, and I love it ... I shall remain here while anyone remains, and do whatever comes to my hand. I may be compelled to face danger, but never fear it, and while our soldiers can stand and fight, I can stand and feed and nurse them. • You glorify the women who made their way to the front to reach you in your misery, and nurse you back to life. You called us angels. Who opened the way for women to go and make it possible? ... For every woman's hand that ever cooled your fevered brows, staunched your bleeding wounds, gave food to your famished bodies, or water to your parching lips, and called back life to your perishing bodies, you should bless God for Susan B. Anthony, Elizabeth Cady Stanton, Frances D. Gage and their followers. • I may sometimes be willing to teach for nothing, but if paid at all, I shall never do a man's work for less than a man's pay. • [T]he door that nobody else will go in at, seems always to swing open widely for me. • Everybody's business is nobody's business, and nobody's business is my business. • The surest test of discipline is its absence. • It is wise statesmanship which suggests that in time of peace we must prepare for war, and it is no less a wise benevolence that makes preparation in the hour of peace for assuaging the ills that are sure to accompany war. • Economy, prudence, and a simple life are the sure masters of need, and will often accomplish that which, their opposites, with a fortune at hand, will fail to do. • Your belief that I am a Universalist is as correct as your greater belief that you are one yourself, a belief in which all who are privileged to possess it rejoice. In my case, it was a great gift, like St. Paul, I 'was born free', and saved the pain of reaching it through years of struggle and doubt. My father was a leader in the building of the church in which Hosea Ballow preached his first dedication sermon. Your historic records will show that the old Huguenot town of Oxford, Mass. erected one of, if not the first Universalist Church in America. In this town I was born; in this church I was reared. In all its reconstructions and remodelings I have taken a part, and I look anxiously for a time in the near future when the busy world will let me once more become a living part of its people, praising God for the advance in the liberal faith of the religions of the world today, so largely due to the teachings of this belief. • I have an almost complete disregard of precedent and a faith in the possibility of something better. It irritates me to be told how things always have been done... I defy the tyranny of precedent. I cannot afford the luxury of a closed mind. I go for anything new that might improve the past. • Others are writing my biography, and let it rest as they elect to make it. I have lived my life, well and ill, always less well than I wanted it to be but it is, as it is, and as it has been; so small a thing, to have had so much about it!